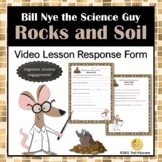 These video worksheets allow students to follow along as they watch all of the the Bill Nye video titles (except the NTV Top 11 Video Countdown) Earth Science Bundle 1. Atmosphere 2. Caves 3. Climate 4. Deserts 5. Earthquakes 6. Earth's Crust 7. Earth's Seasons 8. Farming 9. Pollution Solutions 10. 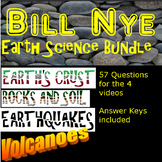 This is a set of questions students can fill in as they are watching the Bill Nye - Rocks and Soil video. An answer key is provided. 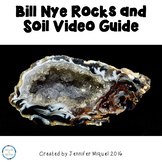 Bill Nye Science Guy Movie - Rocks and Soil. 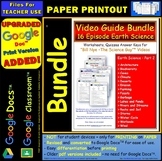 Video Worksheet & Key: Fun! 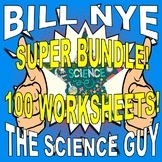 Bill Nye Ultimate Watch-Along Worksheets - 10 Episode Pack! 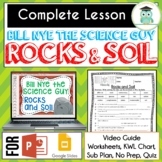 Video guide sheet to complement Bill Nye's episode on Rocks and Soil. Requires simple answers, quote completion or circling of answer choice. 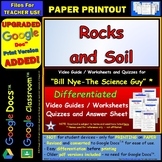 Helps students stay attentive and focused while viewing. 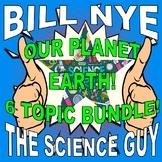 15 questions that go along with the Bill Nye Rocks and Soil episode. 11 are true and false, and 4 are multiple choice.